Confirmation season is underway with Secretary of State nominee John Kerry testifying before the Senate Foreign Relations Committee today. And with the formal rollout of President Obama's second term Cabinet, the debate over whether it includes enough women will likely begin again in earnest. So far in the second term, Obama has nominated Kerry at State (white guy), Jack Lew at Treasury (white guy) and Chuck Hagel at Defense (white guy) while picking Denis McDonough (white guy) to serve as his new chief of staff. So, does President Obama have a woman problem in his Cabinet? Or is this just a trumped-up media storyline? That's where the Center for American Women in Politics (CAWP) at Rutgers University comes in. 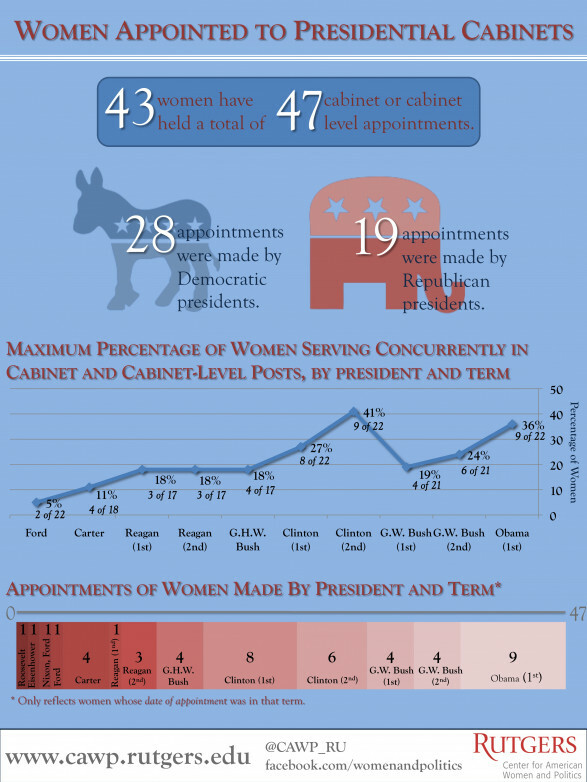 And, specifically, CAWP's chart below that details the number of women appointed to presidential Cabinets (and Cabinet-level positions) dating back to Gerald Ford's presidency. At first glance, it would appear that President Obama's woman problem is overblown. Aside from Bill Clinton in his second term, no president dating back to Ford had a higher percentage of women in Cabinet and Cabinet-level jobs than Obama in his first term. The 36 percent of women in Cabinet and Cabinet-level jobs during Obama's first term nearly doubles the 19 percent who served in the first term of George W. Bush. Of course, numbers in a chart can only tell you so much. The reality is that all Cabinet jobs are not created equal. The big four -- Defense, State, Treasury and Justice -- matter more because they touch so many different and important parts of an Administration. And, the big four -- at least at the start of President Obama's second term -- are all men. Whether President Obama has a woman problem in his Cabinet then depends on your perspective. Is it more important to have females in those big four jobs or at near-record highs as a percentage of all Cabinet and Cabinet-level officials in an Administration? And, why can't it be a both/and?